Performers include: Eric Stonestreet, Sophia Grace Brownlee, Aalyrah Caldwell, Toby Grey, Noah Ritter, Dylan Lauren, Jim Silver, and Jen Tan. A toy design competition series, on The Toy Box TV show, inventors present their toys to the show’s mentors including Dylan’s Candy Bar owner Dylan Lauren, toy guru Jim Silver, and Pixar Creative Director of Consumer Products Jen Tan. If the mentors officially approve a concept toy, its inventor moves on to “The Toy Box.” There, inventors must face the real test and earn the approval of actual kids, including Sophia Grace Brownlee, Aalyrah Caldwell, Toby Grey, and Noah Ritter. These judges choose which toys will progress to the finals. After the season finale, the winning toy will be sold exclusively at Toys ”R” Us. Toy concepts presented in the first season include: a reimagining of the soccer ball with special surprises inside, a racing game where players dressed in a worm costume race to cross the finish line, a multicultural doll collection who sings and speaks in multiple languages, a backyard swing inspired by a surfboard, a party game that launches toys, prizes and candy, a unique double-sided book that makes story time even more fun, a collection of dolls that articulate into ballet positions, and pocket-sized cars that launch with a snap. 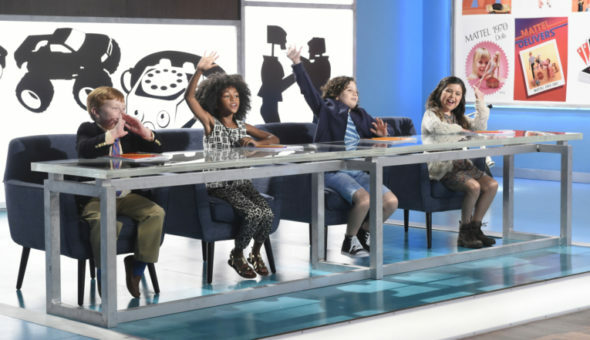 The finalists from each episode return to “The Toy Box,” where the young judges decide who will have their toy made by Mattel and sold exclusively at Toys”R”Us. What do you think? Do you like Toy Box TV show? Should it have been cancelled or renewed for a third season? The Toy Box on ABC: Cancelled or Renewed for Season Three? The Toy Box: No Season Three? Will the ABC TV Show Be Cancelled, Since Toy “R” Us Is Closing? The Toy Box: Cancelled or Renewed for Season Two on ABC? I like the show. Enjoy seeing what toy inventions are being made. Don’t care for the kids doing the judging especially Emma, she is always negative about all the toys. And Noah acts like he is better and smarter than everyone else when in reality we all know he is fake. But there should be Adults judging the products while the kids just test play with them. The kids should not be making decisions about people’s future! The first season was great. I ordered 2 of the winning contestant’s products. This second season, some of the judges don’t seem as mature and should be replaced. It is a wonderful concept. The first show with the adults before the judges works better because there are not so many at the final decision. This show would be ok if they didn’t have the kids as judges! I can’t stand this show due to the fact of the bratty red heads obnoxious behavior! How they can allow this is beyond me! Please CANCEL!!! THIS IS A VERY ENTERTAINING SHOW AND NOAH RITTER IS NOT OBNOXIOUS!!! HE IS A VERY FUNNY KID. CHECK HIM OUT ON ELLEN DEGENERES SHOW . I LOVE ALL THE KIDS AND AS A FORMER PRE SCHOOL TEACHER I THINK THEY TOOK THEIR JOBS AS JUDGES VERY SERIOUSLY. THESE COMMENTS ARE CRUEL AND TASTELESS . THEY ARE KIDS NOT ADULTS , GO BACK TO SHARK TANKS IF YOU DON,T LIKE KIDS. I love the Toy Box. It is very creative, original and the adult as well as child judges are GREAT. It gives a wonderful opportunity to those toy inventors to demonstrate their new toy and to possibly get a contract with Mattel. What a great idea for television programming. I hope it stays on the air!! I found this show refreshing with a variety of newly invented toys and trying to pass the “critics” to get promoted by Mattel or Toys are Us. Would like to see it continue. The show is beyond words for describing just how non-entertaining it is. Three out of the four kids are precocious and appear to be spoon fed their lines that they deliver in obnoxious fashion. This show takes up a valuable prime time slot and should be put to bed with some large doses of Benedryl for the judges! I enjoyed the show and think it should be renewed. There probably are many new inventions that need to be seen! I would really like to see this show continue. I know that it needs a little twaeking but yet it is nice to see a family show that is not BLOOD, GUTS AND MURDER. I really like seeing what is out there, but feel that the show needs to make it more about games for all age kids and family participation as well. Please give them another shot. I I absolutely love everything about The Toy Box. The Toy Box must be brought back for the 2017-2018 TV season. This show is phenomenal. I love Eric Stonetree as the host. He is absolutely sensational. The kids are fantastic. I can’t weight see what toys are going to be on the next season of The Toy Box.